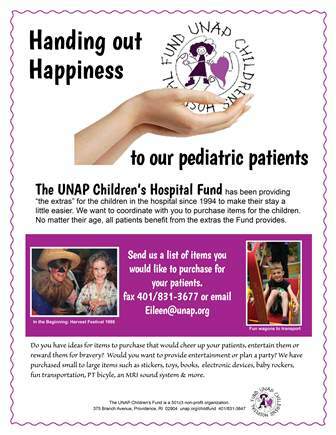 What is the UNAP Children's Hospital Fund? The UNAP Children’s Hospital Fund was established in 1994 by the RI Hospital United Nurses & Allied Professionals to provide “extra” supplies and activities to help ease the hospital stay of pediatric patients at the Hasbro Children’s Hospital of Rhode Island Hospital. The Fund is a charitable, non-profit organization, and is an important part of our Union’s commitment to improve the quality of care for our patients. purchase and convert little red wagons to be used as a “fun” alternative to wheelchairs. purchase physical therapy equipment, books, stickers, toys, televisions, videos, audiocassette players, personal hygiene items, dolls, and many other items for use by our young patients while they are in the hospital. Our fundraising activities have included an annual benefit performance during National Nurses Week, a Children’s Holiday Festival at the Roger Williams Park Carousel, appeals through the United Way campaign, and other direct requests for support. In addition, the Fund receives significant in-kind support from the RI Hospital UNAP. Please select the 'donate' button to support the Fund. Thank you!